Any realtor will tell you that after location, location, location, it is the kitchen and master bath that will sell a home at a higher price. These are the spaces buyers really notice. Think about the last dinner party you went to—you probably spent more time in the kitchen with friends than at the dining room table. This hub of the home has become the central gathering spot. And don’t even get us started on the allure of that master bath showerhead that simulates being caught in a surprise summer shower—every droplet a different size, just for effect. 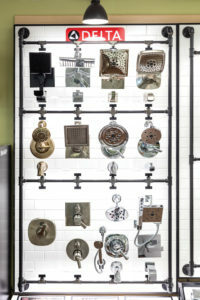 Options for kitchen and bath products have come a long way from the standard faucet and towel rack of yesterday. Now you can outfit your entire home with Alexa-enabled products that will fill a pasta pot with exactly 4 quarts of water or start your shower at 7am at a pre-set desired temperature. 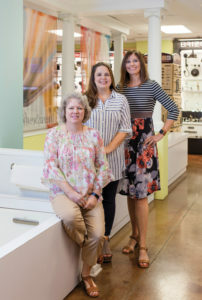 The best place to see all of these new options in action is at the Southern Bath & Kitchen (SB&K) showroom near Sloss Furnace just outside downtown Birmingham. Jeff Rodgers, the Birmingham branch manager, says that outside sales person Heather Wiggins and the team of Vann Foti and Brandi Beard take pleasure in showing off the latest and greatest. In addition to sinks and toilets, SB&K stocks kitchen appliances from brands such as Viking and AGA, ice machines from Scotsman and Marvel, and anything you could want in an outdoor kitchen, including the installation plans to expedite the process. More than a place to simply prep dinner or get dressed for work, kitchens and baths are where we spend a big part of our day. Investing in these spaces is about more than improving the resale value of your home; it’s about enhancing the experience for you. Jeff Rodgers and Heather Wiggins share what’s new in the industry. Jeff: New bluetooth speakers come in a standard 4-inch-tile size that you can just pop in. Heather: French-door ovens, big built-in refrigerators, stoves with multiple burners, and a microwave drawer that goes in an island. Jeff: Beverage centers now feature dairy-rated refrigerators that keep milk—and all your beverages—as cold as you want. Heather: Meet with a professional. 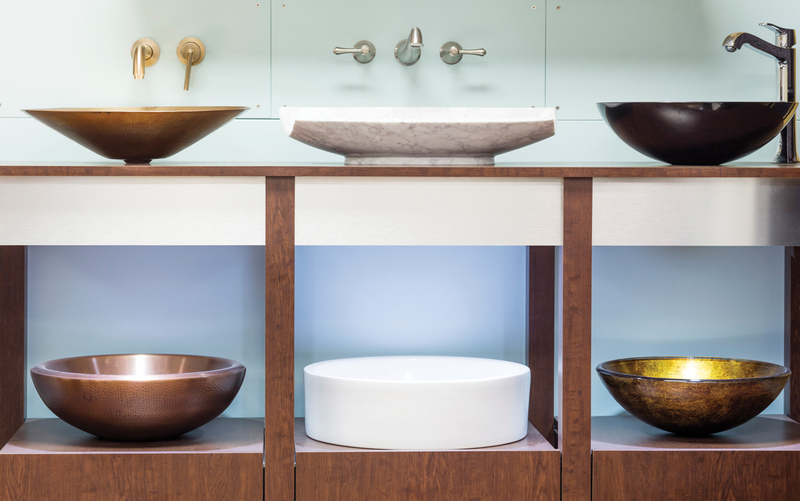 There will always be people who want to just pop into a big-box store and buy a sink, but we know these products inside and out. That is invaluable. Jeff: We’d also say that it starts with the contractor. You want someone licensed and reputable. Do your homework. Jeff: We stock everything for an outdoor kitchen—grills, refrigerators, ice machines, side burners, ceramic smokers. We have a company that will measure your space and send you everything you need to complete the buildout in time for football season.